August 7 – September 30, 2015 – Montgomery Row Second Level, 6423 Montgomery Street, Rhinebeck, NY. “Photographic Solarizations” by William Lulow located at Montgomery Row Second Level is open to the public Monday-Sunday 9am-6pm. Saturday, August 15, 2015 Artist’s Reception. For more information, contact Sue at 845.876.0543 or visit www.montgomeryrow.com. WHO: William Lulow has been a photographer for more than 40 years. He has worked in the studio and on location for a variety of clients including corporations, magazines, advertising agencies and individuals. In addition, he has also taught photography at The New School, The Scarsdale Adult School, Larchmont/Mamaroneck School For Continuing Education, for the NYC Department of Education and privately. WHAT: “Photographic Solarizations” is from August 7 – September 30, 2015 Lulow has long been known for portraiture and more recently has delved into the realm of fine art photography, shooting landscapes and recognizable places which he then infuses with an impressionist feel. He does this by first making a photograph and bringing it into Adobe Photoshop where he applies certain filters to the process and begins to tweak them as to color balance, exposure, hue, saturation and contrast. Basically, they are “solarizations,” and it’s difficult to predict the results. WHY: In the days of film and paper printing, a solarization was obtained by exposing the negative or print to very brief, white light during the development process. That tended to migrate the grains of silver in the emulsion toward the light spots and reversed part of the imaging process so that the shadows were light and the highlights dark. Instead of a positive or negative, you had a combination. A hybrid, if you will. With the digital technique, the result is a kind of synthesis and creates an entirely different image. 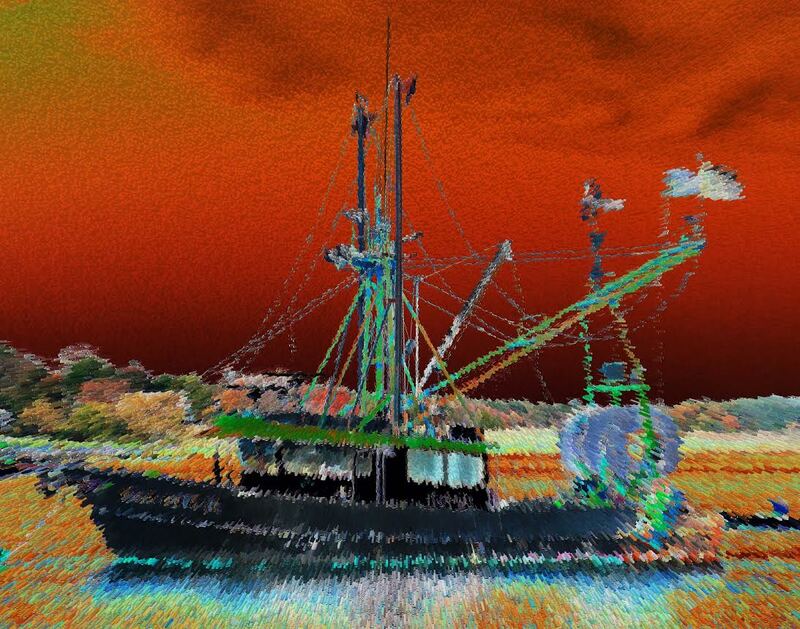 Digital solarizations are done with filters in Photoshop which electronically try to mimic the chemical effect. But, there are certain things one can look for in capturing an original that would make a good solarization. One is blue sky with some clouds. Another is water with reflections and a third is lights. If you can find any or all of these elements in your original, you will most likely come up with a good image to use for a solarization. All prints are on archival paper, signed on the back and/or on the mat itself. They are for sale through the photographer William Lulow (william@williamlulow.com, or 914.263.6213). I just don’t understand what is happening here. I can’t fully grasp what is written in these paragraphs regarding Montgomery Row. Maybe they should be written by someone with a sense of literary training that would help ME understand this solar thing.